Badaam ( Almond) Kheer is one of the most delicious dessert recipe.Which is easy to prepare at home with some material.Like Almonds,milk,Cardamoms,Ghee,Saffrons etc. Almond Kheer is made from milk in India, it looks like Asama which is made in most South Indian homes. The use of saffrons in this recipe is not for only aromatic flavor also for giving a extra rich creamy texture .Almond and milk provide a creamy texture and a sophisticated flavor to this dessert. With them cardamom have also been added so that this dessert gets a different fragrance.Personally, I like the taste of the chilled recipe of almonds, however, some of my relatives do not even eat it hot, even after heating it! 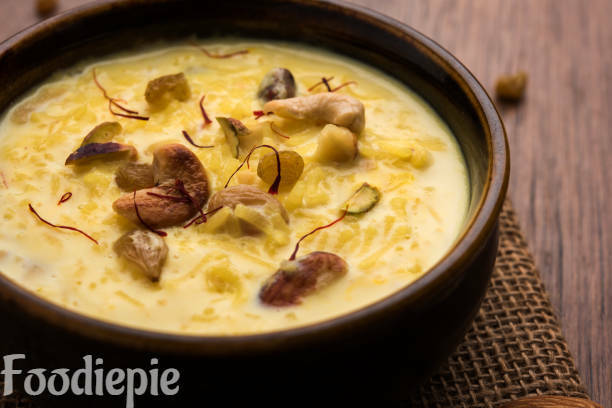 Suit the taste of your guests and enjoy the almonds kheer recipe It seems very tasty in the food, it can serve to the guests, apart from the festivals.Let's checkout recipe. Step 1 : Soak almonds in enough water for 5-6 hours. Remove the skin of almonds and grind to make a smooth paste. Step 2 : Heat 2 tablespoon Ghee in non sticky pan and add almond paste.Cook it over medium flame. Step 3 : Now add milk and almond paste in pan over high flame allow them to boil. Step 4 : When it begins boiling reduce flame to medium-low add cardamom powder,saffron strands and sugar . Step 5 : cook 5/6 minutes on medium flame.stir continuously. Step 6 : Remove pan from flame and let it cool in room temperature. Finally : Transfer it to serving bowl Badaam ( Almond) Kheer is ready to eat. Garnish with chopped almonds saffron strands and cashews.Keep in refrigerator for an hour.serve Chilled almond kheer.